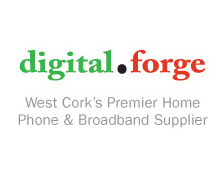 DigitalForge wireless broadband is a high-speed Internet service delivered via wireless radiowave technology. It does not require a phone line and is transmitted from our own Access Points located throughout West Cork. Once we have verified line of sight from your house to one of the Access Points we install a small antenna that is aligned to receive a signal directly transmitted from the Access Point . There is a Cat5 cable attached to the antenna which terminates inside the house. From there you can either plug directly into your computer or you can have a wireless router which will allow you to use laptops, iPhones, etc. within the house. How do I know if I have line of sight? We will have a good idea by your location or if you have any family or friends nearby who have a connection with us. If we are not 100% sure then we will send a technician to complete a site survey for you. There is no charge for this but we generally encourage our customers to have an idea of the package they would like to take and try to schedule enough time to complete the installation on the same day as the site survey. This means we do not leave anyone waiting too long for their service. How long can we expect to wait for an installation once we have requested it? We always aim to have you installed within two weeks of a request. Installation of the antenna, associated cabling, poe and power supplies is 99.00. If you are taking the optional Phone Service the handset is free. The payment for the installation is made to the technician on the day of the installation. He will leave a receipt for you. The monthly fee is paid via direct debit and the technician will have the relevant forms and paperwork for you to complete the day of the installation. Any calls that are not free can be paid for on a link to Paypal through your online account that we create for you. If you do not have a credit card or PayPal account then you can topup with our sales department for amounts of 40 euro or more. How do I know that I am getting the speeds that I am paying for? The technicians set the speeds on your antenna according the package you are taking on the day of installation. You can check your speeds at any time by using the following link www.speedtest.net . If you have any questions regarding your speeds or package please contact the office and we will be able to advise you. Please contact our office immediately. If there is a network outage it will be fixed quickly. If you have an issue with the equipment at your house we will try to determine the problem on the phone. If we cannot fix the issue for you remotely then we may need to send a technician and will always endeavour to schedule that as soon as possible. There may be fee applied depending on the nature of the problem and that can be discussed with our technical support or sales team in the office. Yes. You will need to make sure that your Outgoing Mail Server setting is set to smtp.digitalforge.ie and the technician will be able to help you with this on the day of installation. Otherwise you can call our technical support team and they will be able to help you. How do I know how much of my download limit I am using? You will get an automated email when you reach 50%, 75%, 90% and 100% of your download limit throughout a calendar month.If you don’t ever receive these emails it is probably because you don’t exceed your limits regularly. If you exceed 100% of your limit before the end of the month on a regular basis, we recommend you contact the office to discuss upgrading your package. Can I use my fax machine with this service? No. Facsimile technology works through telephone lines and as we do not use telephone lines this service would not be available. There are fax to email applications available now which would be an alternative to using a fax machine. What Equipment is included with the Phone Service? We supply you with a Siemens cordless phone and a base station for the phone. The handset can live anywhere in the house within range to the base station. The base station will live where the cable from the antenna terminates within the house. What if I want to have more than one handset? If you have existing cordless phones then we should be able to configure them to work with our system. Although this is not guaranteed we would estimate that 99% of existing handsets should be compatible. Alternatively you can purchase additional handsets for 50 euro and our sales department will be able to help you with that. Yes. You will need to fill out a port request form and there is currently no fee for this service. Alternatively we can give you a new number free of charge. How does it work? What do I have to do in order to make a call? Like an ordinary telephone line you just pick up the handset and place a call. The only difference is that you will have to enter the full area code for all numbers. How do I access/set up my voicemail? To access your voicemail please dial 171 on your phone. Type the password when prompted on the keypad of your phone. You can find your pre-set password on the sheet given to you on the day of installation. If you have mislaid the paper with your passwords you can contact the office . The standard setting is that calls will be forwarded to the voice mail system after 50 seconds. The time can be changed by us, please feel free to call us to change the time before calls get forwarded to voicemail. Simply dial 1000 to call us for free. Calls which arrive at the voicemail system will hear your greeting or if not setup, the caller will hear the default greeting e.g extension 5000 is not available. There are 3 different greetings. Unavailable, Busy and Temporary Unavailable. You can record your own messages by using option 0 from the main menu. 1 is your Unavailable Message (no answer to a phone call). 2 is your Busy Message (you are on the phone). 3 is your Temporary Unavailable Message (in case your account supports the Do Not Disturb feature). To change your password please use option 0 from the main menu followed by option 5. How do I log into my online account and check my usage or simulate what a call may cost me? To login to the User Interface please type your username (your 4 digit internal number) into the field “User:” and your password into the field “Password:”. Click the “LOGIN” button. If you have forgotten your password and you have supplied an email address please use the link below the “LOGIN” button. Then type your email address in the field of the new page and click the “SUBMIT” button. On this page you will find your account details at the very top. Please notify us in the event that any of your detail might change. In the section below that you will find your account number (Card Number) and your remaining credit. If you run low on credit please click the “BUY NOW” button and chose one of the values shown to top up. You can either use PayPal or pay directly by Credit Card on the PayPal website. To the left you will find links to the different sections of the User Interface. Following the link “Call History” will show you all successful calls of the current day. If you would like to see the current month or a particular day please make the selection accordingly in the top part of the page. You can also just list calls to a certain number by typing the number or part of it into the field “Destination”. Then click the “Search” and calls will be listed according to your selection (see picture below for example). To find out how long your credit including free minutes will last or how much a call is per minute you can use the call “Simulator” The simulator does not actually call any number, it will only display the rate and the remaining minutes available to the number you type in. Above example shows the time available and the rate to the number of the Digitalforge office. To change your password please click on the link “Password” in the menu on the left. Then type your desired password in BOTH lines and click on “Save”. After you have changed your password successfully your browser will show you a notification. How do I top up my account via PayPal or Credit card? Please follow the instructions given here to purchase credit. You may use a Credit Card or pay with your PayPal account. Please click the “BUY NOW” button on the first page you see after login. If you have clicked “BUY NOW” you will be asked to “continue”. Next you will see the page shown in the picture above. Please select the amount of credit you would like to add to your account in the field “Total Amount”. Currently you have the choice between 10, 20 and 50 Euro. Next click the “continue” button. Next please confirm your order of credit. Simply click “confirm order”. If you decide to change your order please click on “Account Info” and restart the order procedure. If you confirm your order you will be redirected to the PayPal website. You can chose between payment by Credit Card (left section) or you login to your PayPal Account to finalize your order.